First Fridays is a monthly event that takes place on the first Friday of every month within Winnipeg's historic Exchange District. It was initiated in July 2010 by Sue Gordon and Karen Schulz. Click here to be taken to the First Fridays official website. 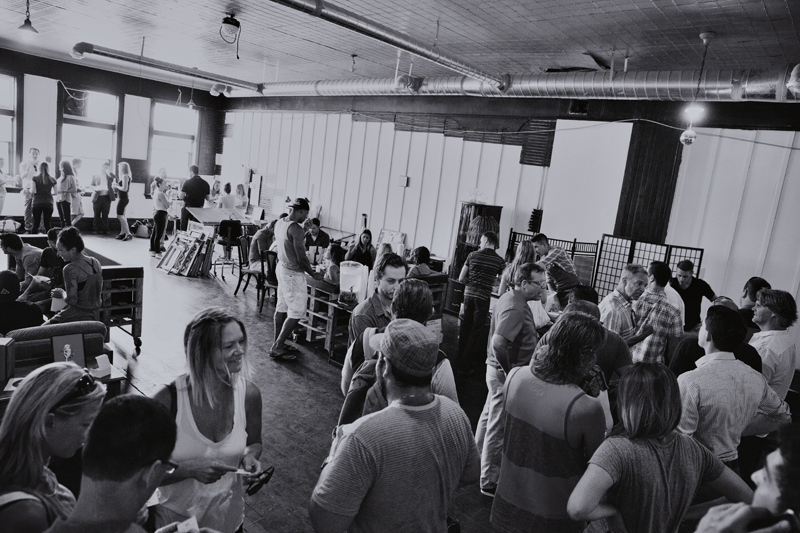 Come let loose and get creative at one of anARCHI design's Drink & Draws, an increasingly popular First Friday event. Grab a refreshment, a small canvas, and some paint and unleash your inner artist. Don't be shy! Here's an opportunity for you to paint your heart out within a comfortable, relaxed and FUN environment. No matter what your artistic level, being creative is a wonderfully liberating activity in which everyone should have the opportunity to participate, however the resources (and encouragement!) to do so are not always available. D&Ds offer the right context, space, materials, and company for individuals to freely express themselves through art. Come hang out, paint whatever you like, and let the Drink fuel the Draw! We paint most First Fridays between 8pm and 11pm at King + Bannatyne sandwich shop. Great for one-on-one dates, group outings, or even some solo creativity time. Email design.anarchi@gmail.com to reserve your canvases (not mandatory, though recommended). $15/$18 gets you your first drink and all supplies. Be sure to make the next Drink & Draw a stop on your First Friday itinerary, a fun way to wrap up your work week, or simply a creative way to start your weekend! Event photos on Facebook. 1 THING @ THE KNNDY: A LIVE creative collaboration of Winnipeg art + music + dance. POP-UP #2: "ABSTRACTING ARCHITECTURE. PART I OF II: ENGAGING WITH THE HAND". POP UP #1: anARCHI design / KING + BANNATYNE COLLAB.